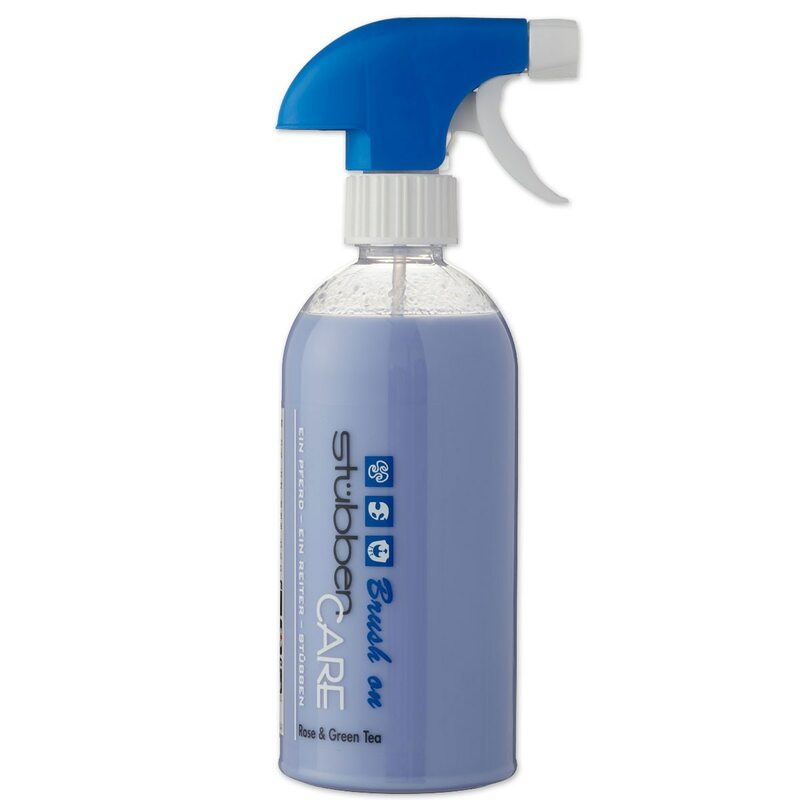 Stubben Brush On Care will give your horse’s coat a real show sheen every time! This spray has a light Rose & Green Tea scent. • Perfect shine every time! Stubben Brush On Care is rated 5.0 out of 5 by 2. Rated 5 out of 5 by baskazel from Works great on a full tail I have a Haflinger with a full tail. I tried this product based on the one review here. It is a fantastic product. It doesn't leave any residue in the mane and tail as some products do. But, 2 days later, I can easily run a brush through my horses tail. I can't say I could do that with any other product I have tried. The scent is a bit perfumy to me personally, although I am getting more used to it. Rated 5 out of 5 by Luv OTTB from Best product ever for detangling tails! This is *BY FAR* the best product I've EVER used as a tail detangler. Spray on, wait a few minutes, and the brush just glides through the hair. It seems to last for a few days, too. I know other products have made that claim, but it never seemed to hold true. I have used Cowboy Magic in the past and hated how messy it was - my hands were full of gunk! The dirt clung to them and it was hard to wash off. Show-Sheen and other similar products left a residue on the hair and seemed to attract dirt. I liked the EQyss Avocado Mist until I tried the Stubben Brush On Care - it beats the EQyss hands down. The spray bottle is a nice quality too - a good sprayer / comfortable trigger. And the bonus is that it smells great! I can't count how many times that people walk by after I sprayed it and want to know what perfume I'm wearing. (Not an overpowering scent - just pleasant.) I only wish that SmartPak would also carry the 1 L refill bottle in addition to the 500 ml spray bottle.